With Halloween quickly approaching I thought this would be a great time to share one of our Disney Villains Inspired Pumpkins. Honestly, I didn’t think I would be able to pull this one off before Halloween, but I quickly realized that it is one very easy pumpkin to do and I wanted to share with you all so if you wanted to create your own Disney Villain Pumpkin before Halloween night. 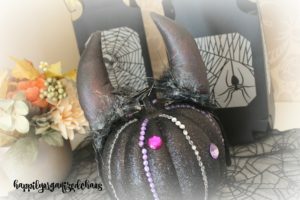 I didn’t want a pumpkin that was Maleficent’s face, I wanted one that when you looked at it, you knew it was supposed to resemble Maleficent but not actually be Maleficent. 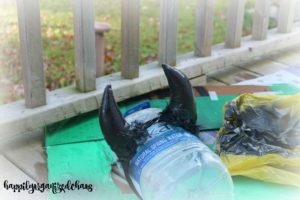 So let’s jump right into how to create your own “Disney Maleficent Inspired Pumpkin”. 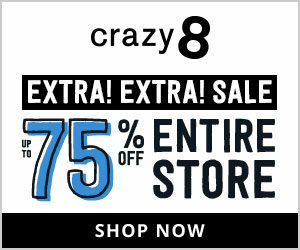 To start you will need to get all of your items together. I just went to Walmart and the Dollar Store and was able to find everything I needed within my tight budget. 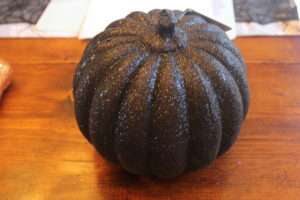 I was originally going to paint my pumpkin black but when I was shopping at Walmart I came across this perfect black, sparkly pumpkin that was just perfect for Maleficent. This way I will be able to keep this pumpkin for years to come as well and I wouldn’t have to throw away when the pumpkin got old. 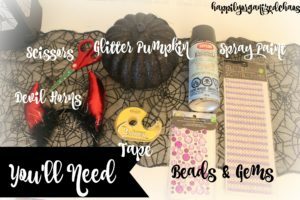 I the took the jewels and gems that I purchased at the dollarama and started to stick them on the pumpkin using the double sided tape (you can also use a hot glue gun, which will probably work better but I didn’t have one on hand). 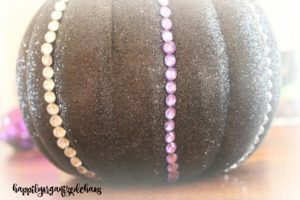 With these jewels and gems I just followed the natural grain of the pumpkin and alternated colors. I had purple and white jewels. 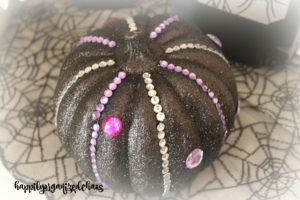 Then I took the gems and just randomly placed them all over the pumpkin. 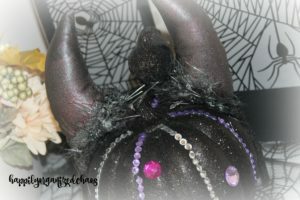 After that was complete, I had earlier taken the devils horn headband outside and had spray painted the red horns black. To be completely honest, I think I would really prefer to find black horns and if those could not be found, use a fabric paint versus the spray paint. While this worked, I could still see the red through the black. Once I placed the black horns on the pumpkin I though it would be perfect to add the black crow on top. 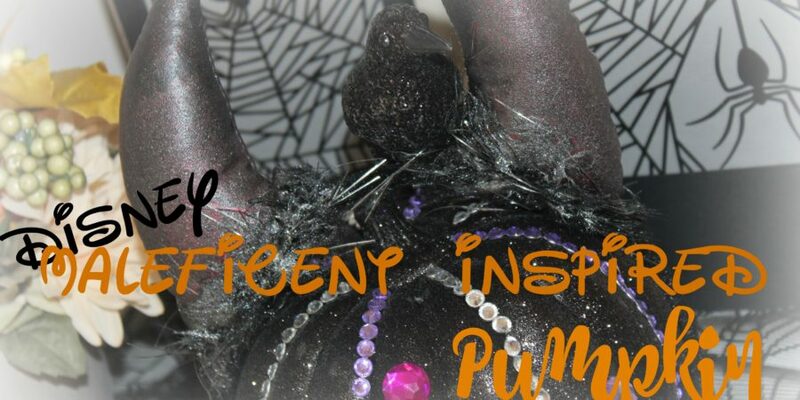 Voila, you now have a pumpkin that is inspired by my favorite Disney villain, Maleficent. I hope you enjoyed this post. 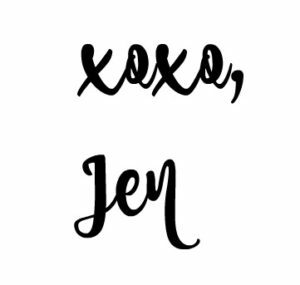 Thank you for taking the time to stop by and read and as always, take care and have a wonderful day and a safe Halloween!